Nicola Ross is a well-known writer and hiking adventurer who shares the road in her books, Caledon Hikes and Halton Hikes Loops and Lattes. There are 37 loop routes in each book. She explained the titles during a recent conversation over coffee one day last week. Her home turf, writing about Caledon, was natural. She began by putting together a beautiful coffee table book with stories of local history, notes about the local flora and fauna, all accompanied with photographs by Gord Handley, published by Boston Mills Press out of Erin. This popular publication was followed by another similarly dazzling book, Dufferin County, with photos by Rosemary Hassner. Other writing successes, other commitments filled her life but she longed to write her own book. One birthday, her partner, Alex Strachan, told her, that for her birthday, he wanted to back her to simply sit down and write her book. To put such a book together of hiking in loops of varying lengths and difficulties in her beloved Caledon was a perfect match and a great labour of love. Her experience and flair for non-fiction writing combined to deliver a masterpiece of highly digestible information and well tuned advice. It led inevitably and as a commercial venture to her second round of hikes – in Halton. There are real rules of the trails and she has been careful to itemize them, most importantly of which is: stay on the trails. Many walking pathways require permission for use and this is preciously guarded. Control of dogs is important. Respect for the environment and the property of the people who live by the trails is essential. The directions are fulsome, filled with the joy of the hike and all there is to experience. They not only include accurate maps, minute details of how to follow each trail but also note the vistas, the “big old cherry tree,” the time she saw a snapping turtle and other natural marvels. For each loop, there are notes about the length, degree of difficulty, how many steps/hours it takes to walk the distance and the calories the effort consumes. To be out in nature, were her comments; we know it is good for us, restorative, health-giving, away from all the bustle of our commercial lives. There is more to the tale of the publication of these books, for Ms. Ross decided to self-publish, determined to market them herself. She did so to great effect, cold-calling on book stores and others, with books under her arms. Reluctance to stock many at first was soon replaced in several shops by large orders where the books flew off the shelves. Ms. Ross was subsequently approached by Hamilton tourism people to write a “hikes” book about the Hamilton area, which is now another of her current projects. 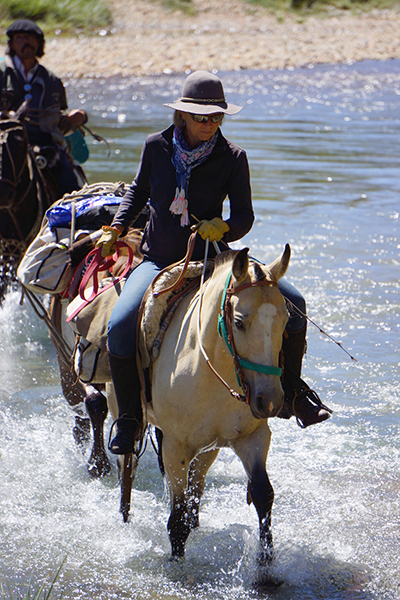 Stepping aside from the adventure of producing these books, which she is quick to say, was far from being a solo effort; a great many people – friends and professionals – assisted by testing her findings on each loop and providing additional information, editing, designing, photographing – moral support, we digressed into another of her recent adventures – riding the countryside in Argentina, specifically Patagonia. At one point, they arrived to a couple of towns, settled generations ago by the Welsh. They rode into a farm property and asked to camp, their horses were welcomed. Their guide, Beto had 21 siblings and found family or friends of his family everywhere they went. The Welsh village nearby was the setting for the film, Butch Cassidy and the Sundance Kid. For information, to order books, read her blog and all that, go to her website: www.nicolaross.ca.